On a new site behind the Royal London Hospital in Whitechapel four quirky seminar pods have emerged suspended from a laboratory ceiling. The range from a ‘delicate, fabric-wrapped oval spacecraft’, to ‘spiky deep-sea creature dressed in black oil skin’, and provide a series of meeting rooms for the university staff and students. Why Architenis immensely proud of. 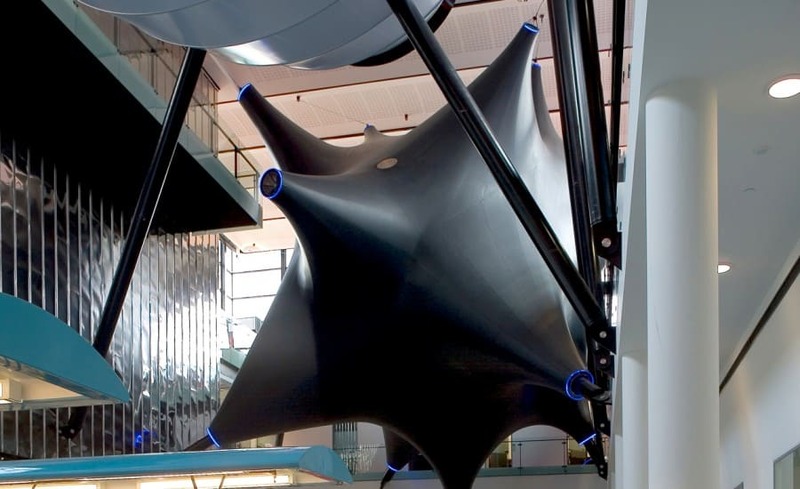 Its curving form, likened to a giant deep sea creature with 12 sharply pointed arms flailing in all directions by one journalist, is made from black PVC coated polyester to provide a smooth and oily appearance. Its outlandish form meant design and construction of such a structure were complex. Spikys structural demands were determined by 3D computational modelling techniques while fabrication aspects of the concept were developed with the help of scale models. 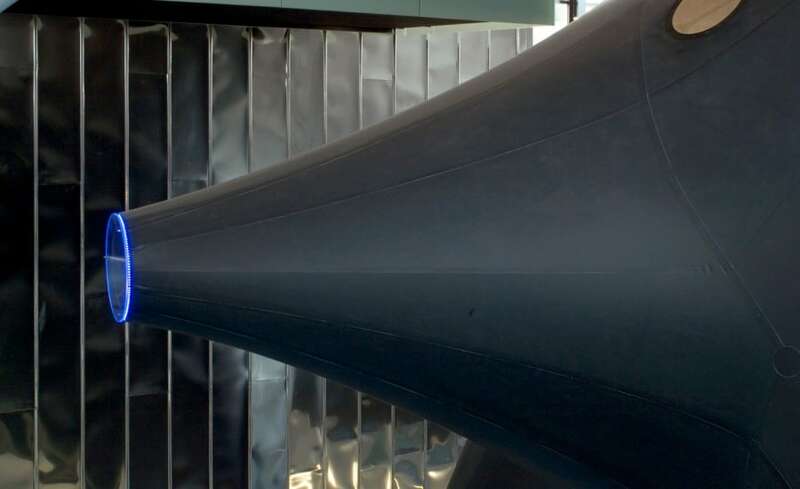 From these Architen Landrell created the material template and fabricated the full-scale tensile structure in PVC-coated polyester, chosen for its high strength and elastic properties. 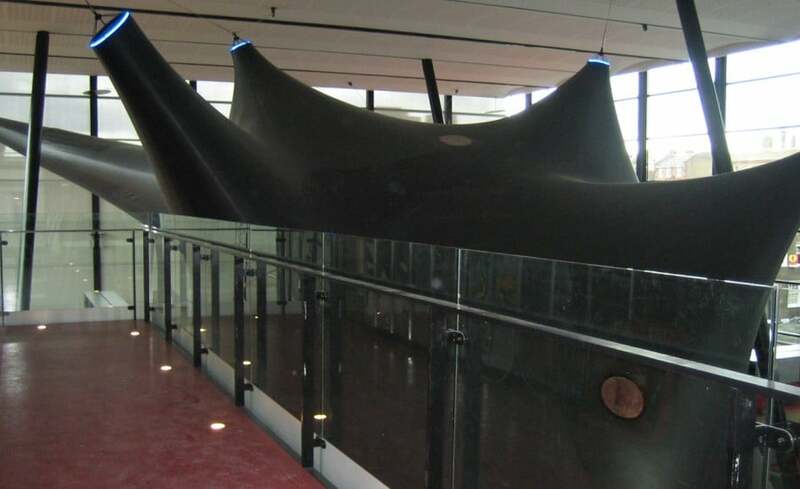 Spikys one-tonne single piece fabric membrane was then erected in a complex series of pushing and pulling techniques, closely monitored to ensure it became as taut as possible without exceeding design loads. As leaders in fabric engineering Architen Landrell were one of the few companies which could accomplish this compex task. The outcome is not only a powerfully effective highlight of this new research centre but also a stunning demonstration of the capabilities of tensile fabric in interior design, says Alex Heslop, Director of Design and Development at Architen Landrell. 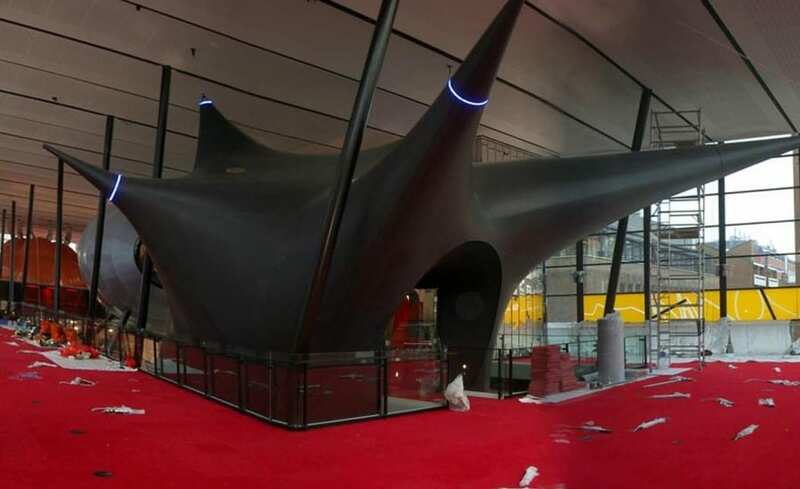 This highly demanding structure was erected on schedule, within one month, and is now showing the world how far tensile fabric structures can go in creating dramatically effective interiors for new and existing buildings. Fabrication of Spiky was more challenging than anything weve done before it was so extreme at every stage. Yet it has raised our standards, our technical abilities and our confidence for tackling future projects of exceptional complexity.